Lackawanna League wrestling matches were cancelled last Wednesday, forcing them to Monday, Jan. 28, but area grapplers hit the mats over the weekend in the annual Coal Cracker tournament. Panther Valley High School hosted the tourney that featured 37 teams from eastern Pennsylvania and bordering states. Blue Ridge and Montrose both attended this year’s event with the Raiders finishing in the top half coming in at 17th. Montrose placed 24th. Joe Hester was the top local individual wrestler as the Montrose senior finished in 4th at 138 pounds. Hester opened the tournament with three wins pinning Scranton’s Mariano Monacelli in 30 seconds; and followed that with a 20-5 Technical Fall over Valley View’s Kyle Novajoksy. In the quarterfinals, he pinned Edwin Kent of Church Farm School in 1:24. Hester then suffered his first loss in a 3-0 decision to Palmerton’s Lucas Christman. He rebounded with a 16-1 Technical Fall over TJ Aldefer of Faith Christian Academy. In his final match, Hester fell to Notre Dame-Green Pond’s Nick Vonelli 6-2 to earn the fourth-place medal. Blue Ridge’s Nathaniel McArthur finished in fifth place at 126 pounds. He also started out with three victories. He pinned Valley View’s Jack Baronski in 1:22; and followed that with a win by injury by default over Springfield Delco’s Jason Terzoglou. McArthur was up 10-9 when Terzoglou had to bow out at the 1:07 mark. He then won 1-0 over Montrose’s Andrew Rosevear to earn a trip to the semifinals. In a hard-fought match with Midd West’s Ethan Zevan, McArthur fell 1-0 in sudden victory. McArthur was then pinned in the consolation semifinals by West Chester East’s Corey Celenza. But he rebounded in his next match to gain a 7-4 decision over Tamaqua’s Randolph Steigerwalt. Blue Ridge’s team finish was aided by having three individuals finish in 8th place. Gavin Crawford captured 8th place at 113 pounds. He opened with a pin of Bloomsburg’s David Klingerman in 1:12, but fell in round two to Catasaqua’s Cole Brown falling at 4:46. Crawford rebounded with a quick pin of Tamaqua’s Nick Wall in 18 seconds; and then pinned Zach Murphy of Hanover Area at the 4:26 mark. He got his third pin in a row when he decked Gabe Heaney of Jim Thorpe. In the fifth round, Jake Dellicker of Northwestern Lehigh won a 14-3 major decision over Crawford. He was then pinned by Abington Height’s Cole Kroptavich in 2:49. At 152 pounds Blue Ridge’s Adam Roe opened the tournament with two pins. Roe pinned Souleymane Diarra of Overbrook High School in 25 seconds and followed that with a pin of Springfield Delco’s Ethan Scott at the 3:11 mark. In the quarterfinals Sebastian Corrales of Church Farm School defeated Roe 19-1 to earn the Technical Fall. Roe rebounded with a 7-1 decision over Gettysburg Area’s Garrett Young. Roe fell in his final two matches getting pinned by Hazleton’s Bryce Molinaro in 2:03 and then dropping the 7th place match to Chet Pesta of Williams Valley in 12-2 Major Decision. Tom Gudykunst was 8th at 160 pounds opening with a Technical Fall over Crestwood’s Brian Costello. 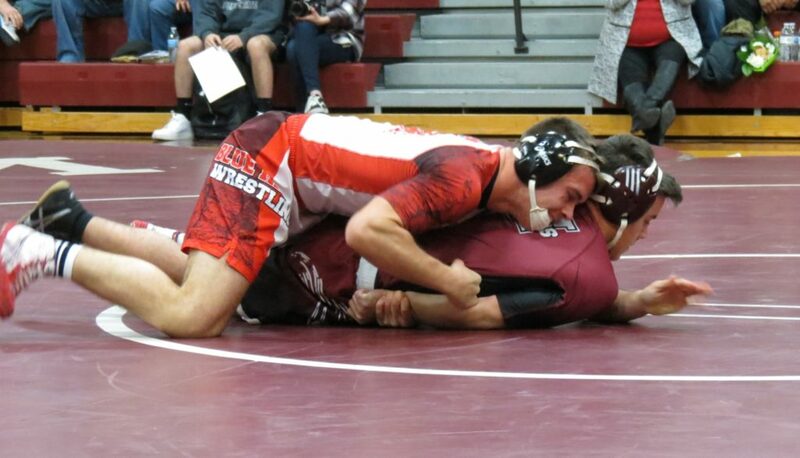 He then dropped his second-round match when Hayden D’Angelo of Scranton pinned him in 1:45. Gudykunst rebounded with three straight wins. He pinned Carlisle Area’s Ridge Wargains in 4:59 and then took down Salisbury’s Ben Krauss in 42 seconds. Gudykunst the won a 12-3 Major Decision over Ryan Haas of Northwestern Lehigh. Montrose’s Bryan Ryan was the other local wrestler to place when he finished 8th at 182 pounds. Ryan opened with a pin of West Chester East’s Sean Mackin in 1:19 and then followed that with a pin of Britton Walters of Faith Christian Academy in 2:41. He suffered his first defeat in the quarterfinals when Hazleton’s Jayson Brielmeier won a 7-2 decision over Ryan. He came back with a pin of Catasaqua’s Adam Reinhard in 46 seconds. Ryan finished with two losses by decision when Northwestern Lehigh’s Tyler Watson edged Ryan 5-2 and then Tamaqua’s Carson Krell defeated Ryan in an 8-5 decision. In Lackawanna League action Mountain View fell to Scranton Prep 57-18. Nathan Ofalt pinned Mitchell Kirby in 2:47 at 138 pounds to pick up a win for Mountain View. Caylee Gregory picked up a win at 106 pounds when Scranton Prep’s Bradyn Genello was disqualified. Josh MacDonald picked up a forfeit win at 220 pounds. Mountain View’s Kyle Pissot (132) was pinned in 2:53; while Logan Sprague was decked by Prep’s Joe Monahan in 2:57 at 152 pounds. The Eagles’ Jeremiah Schwartz fell to Alec Buttner in 4:29 at 170 pounds and Zeb Gregory lost a close 10-7 decision to Prep’s Will Ferrario at 182 pounds. Be the first to comment on "BR, MA wrestlers compete at Coal Cracker"